Airbnb, the “sharing economy” success story with nearly as big a chip on its shoulder as that other “sharing economy” hegemon Uber, had to pull down a set of cloying billboards bragging about the company’s $12 million tax contribution to San Francisco after someone told them they made the company look passive-aggressive and entitled. The company had launched the campaign prior to an upcoming ballot initiative to more strictly regulate the service. The ads read as a series of quick notes from the “quirky” firm to the city, ever so gently reminding citizens of all the good they’ve done for which they’ve been presumably underappreciated. We’ve all had this conversation with a resentful roommate or lover, and it usually goes about as well. Naturally, the good-natured people of San Francisco, many of whom are fed up with the negative effects of Airbnb, went off on the $8 million campaign. Social-media posts lambasting the arrogant notices have led to the company walking back their snark and pulling the ads. SF Weekly reminded readers that the very $12 million Airbnb coughed up was the first tax payment ever made by the company, and was only paid kicking and screaming, after years of them failing to contribute their share. Nationwide, the company has similarly done its best to avoid paying taxes. It owes up to $200 million in back taxes to some of the largest municipalities in the country. Certainly, many in New York City have similar concerns. Dear Airbnb, please don’t pull this stunt in New York. 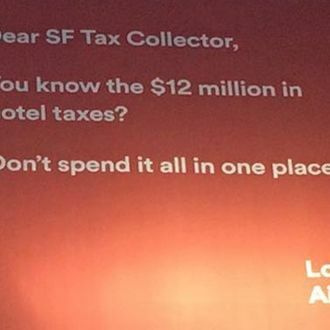 Airbnb’s Passive-Aggressive Ads Backfire in S.F.